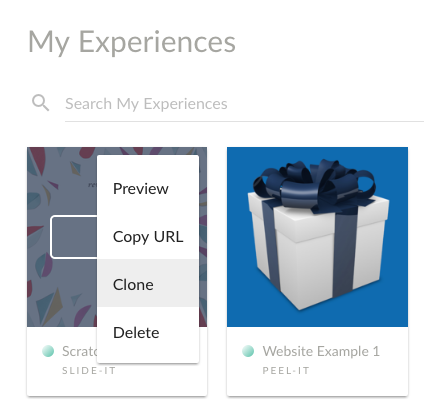 Building a replica Experience Page with a different url is simple. First go into your Zembula dashboard. On the left sidebar, click "Experiences." Click on the upper right of the experience you would like to clone. You'll see a drop-down with the option to clone the experience. This will create a cloned, but unpublished version of the exact same Experience Page with a different URL. Remember, if you're adding an email merge tag or any other tracking codes to this campaign, you will still need to append them, as this is a unique URL.